Roaches are one of the most resilient and adaptable pests on the planet. Also, these scuttling menaces are associated with several diseases, including salmonella, streptococcus, and staphylococcus. The cockroach can also carry viruses, including polio. As if that wasn’t bad enough, roaches ingest bacteria as they feed. When they vomit and defecate on food, the bacteria can be transmitted to your family when they eat the contaminated food. Roaches are extremely difficult to eradicate, primarily because they are so good at hiding. During daylight hours, roaches secrete themselves in crevices and cracks in walls, breaks in foundations, behind cupboard linings, inside door frames, etc. And it's this tendency to hide that makes roach sprays such a useful product. When powders, bait stations, and gels aren’t working, using a roach spray can be the strategy that puts the final nail firmly in the roaches' coffin. That’s why we’ve put together this comprehensive Buyers’ Guide to the best roach sprays that are currently on the market. Most of these roach sprays contain chemicals that are highly toxic to roaches. Although in small doses, none of these products are dangerous to humans, we recommend that you always wear gloves when handling them, and be careful not to inhale the spray. Click on the links to view the full product description and check out reviews left by other purchasers, then place your order and wave goodbye to your roach infestation nightmare! NB: Some of these products are available in packs of two, making an online purchase much better value than you'll find at your local grocery or DIY store. 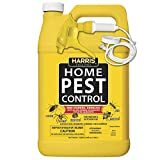 Harris is a well-known name in pest control products, and their roach spray is one of the best sellers on the market. The spray is odorless and non-staining, so it won't ruin your floors or furniture. Once applied, the spray can work for weeks. The gallon container and 12-month residual kill formula make this product exceptionally good value for money. The product becomes ineffective if the sprayed area becomes wet, meaning you'd have to reapply frequently to your kitchen and bathroom floors, and countertops. Ortho Home Defense roach killer is a best-seller. The spray container comes with a battery-powered wand, allowing you to precision-spray tight spaces where roaches could be hiding. The battery-operated wand can run out of power after heavy use. Some users report having to tilt the container at a precise angle to get the spray to work properly. This cleverly formulated product kills roaches and clears away their secretions too. That means there will be no disease-ridden sputum left behind to contaminate your home, and the pheromones that attract new cockroaches are also neutralized. KILLS FOR UP TO 12 WEEKS: Kills for up to 12 weeks on non-porous surfaces; excluding Oriental cockroaches. USE AS A SPOT TREATMENT INDOORS: Use along & behind baseboards, around & beneath appliances, beneath & behind sinks. EcoSmart’s roach killer eradicates live roaches effectively. 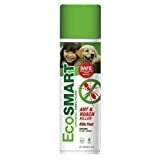 The spray contains no toxic chemicals, making it safe to use around dogs. Although the product labeling says it’s safe to use around pets, the oils it contains are toxic to cats. The product leaves an oily residue. 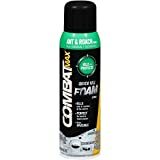 Combat's roach spray is unique in that it morphs from a spray into a foam. The foam rapidly expands to fill the tiniest openings and cracks, cutting off potential escape routes for roaches and ensuring maximum penetration. You may need to use multiple treatments of the product on porous surfaces to exterminate all roaches. How do roaches invade your home? Homeowners who discover a roach infestation are usually horrified, wondering where on earth the pests have come from. After all, everyone knows that roaches only gather in dirty, unsanitary places, and filthy, unkempt homes, right? Roaches can flatten their bodies, allowing them to squeeze through the smallest of crevices. That makes it virtually impossible to cut off every potential roach entrance point. Also, roaches can be transported into your home on visitors' clothing, in luggage, or even in secondhand kitchen appliances and furniture. Roaches are primarily nocturnal, hiding away until darkness falls, the lights go out, and the house is quiet. Then, the insects emerge from their hiding places to forage for food. What makes roach sprays so effective? Unlike baits and traps, roach sprays can be directed right into the tiniest roach hiding places, killing them quickly and efficiently. Fumigation methods used by pest control companies mean that you'll have to evacuate your home while the treatment is taking place and for some days afterward. Roach sprays can be used without disrupting your home life. Also, roach sprays are very readily available, either from your local grocery store, DIY shop, garden center, or conveniently online via the links we’ve provided in the product review section of this guide. Although roaches are one of the most resilient creatures on the planet, roach sprays exploit their main weakness. Cockroaches have millions of microscopic pores on their hard outer exoskeletons that allow them to breathe. Roach sprays use the insects’ respiratory mechanism as a delivery system for poison. Roach sprays contain toxic chemicals that enter the roach's body through the pores on their outer shell. These chemical toxins act on the roach's central nervous system, weakening and eventually killing the insect. Some roach sprays kill the insect immediately on contact, whereas others are a slow-release poison. So, what about home-made roach spray? A Google search will undoubtedly throw up lots of suggestions for DIY roach sprays. But be warned; it’s not recommended to go this route. Roaches will not be killed or deterred by spice oils, citrus extracts, or vegetable peels. Instead, the insects will crawl right over these hurdles and disappear, unharmed, back into their hiding places, leaving a trail of secretions behind them. Roach secretions are loaded with chemicals and pheromones that are designed to attract other roaches to the banquet in your kitchen. Also, the roaches will tramp bacteria and other undesirable biological toxins right across your countertops, floors, and exposed food, potentially exposing you and your family to danger. So, always use a recommended chemical roach spray, like those we’ve reviewed for you in this guide. Is roach spray safe to use around children and pets? If you have young children or pets, you’ll want to be sure that roach sprays are safe to use in your home. Well, you'll be relieved to hear that roach sprays are the safest and most effective way of eradicating these pests from your home. So, roaches are small. Therefore the amount of toxin they need to ingest to die is proportionately low. If a person or an animal such as a dog ingested roach spray, it would need to be in a vast quantity to be harmful. Also, roaches ingest the poison contained in the spray very quickly, via the pores in their exoskeleton. If a child or a pet consumed some roach spray, the active chemical agent would be weakened so much by the digestive system that it would not be harmful. However, accidentally inhaling the spray can irritate the nose, throat, and lungs. It can also affect the central nervous system if inhaled in very high doses. For this reason, be careful to keep well back when spraying the product, and make sure that the room you're treating is well-ventilated. That said, prevention is better than cure. Always store all pesticides, including roach spray, in a secure place that's well away from kids and pets, ideally in a locked cupboard. How long does roach spray take to work? As we've already said, roaches are incredibly tough and challenging to get rid of. But don't despair if you still see roaches after you've used a roach spray. Although most roach sprays will kill the pests on contact, some species of roach have developed a resistance to certain pesticides. That's why most roach sprays use a slow-release toxin that is long-lasting and also forms a toxic barrier to prevent new roaches from establishing a colony in your home. Roach eggs are resistant to roach spray. That means you'll still see new roaches appearing long after you sprayed and destroyed the original crew! Keep spraying any roaches you see, and eventually, you'll have success in wiping out the whole lot. In this Guide, we’ve given you an insight into the habits of roaches and how roach sprays work. In this section, we’ll answer many of the most commonly asked questions by householders who have a roach problem. If you don't see the information you're looking for, contact us through our site, and we'll try our best to help you. A: Roaches can carry diseases and track bacteria across countertops, kitchen floors, food cupboards, and uncovered food. If you eat contaminated food or get bacteria on your hands after cleaning up dead roaches, you could become ill.
Roaches do sometimes bite people. The bites can cause lesions, localized swelling, and minor irritation. Bites can cause minor wound infections too if they're not washed and cleaned immediately. Q: Do I need to evacuate my home when using roach spray? A: No. You can safely use roach spray in your home without having to move out while it takes effect. Q: Is roach spray toxic to pets and people? A: Although the oils contained some eco-friendly roach sprays can be toxic to cats, chemical-based roach sprays are not poisonous to people and animals unless they are consumed in very high quantities. Always keep all pesticides in a safe, secure place where kids and animals can’t reach them. Q: What attracts roaches to my home? A: Roaches are omnivorous. They are particularly attracted to sugar, cheese, meat, starch, and grease, especially if the food is decaying. Roaches can survive for several months without food, so starving them out could be tricky! Q: Where do cockroaches choose to nest? A: The preferred nesting site of the cockroach depends on the species. For example, German cockroaches seek warm, moist areas such as bathrooms and kitchens. The brown-banded roach prefers high places and often nests inside kitchen appliances. Oriental cockroaches nest below ground level in crawl spaces and basements. Q: Does squashing a roach cause it to lay its eggs? A: No. Cockroaches use an “ootheca” (a hard case) to store their eggs in a bundle. Oothecae will be deposited and attached to various surfaces around your home, although some species do store their eggs inside their bodies. Either way, if you squash a roach, all the eggs will be squished too. Using a good-quality roach spray will efficiently kill roaches in your home, especially when used in conjunction with traps, powder, and bait. Of the roach sprays we reviewed, we liked the Harris roach spray in particular. This product offers excellent value for money and comes with a hose-attached spray nozzle, making accurate application a breeze. The spray is EPA-approved and is warranted as safe to use around kids and pets.